This paper analyzes how the supply side of the Western European natural gas market may react if the demand side becomes competitive. We show-using a numerical model of the Western European natural gas market-that once the demand side of the market is liberalized, each gasproducing country has an incentive to break up its gas sellers. The model therefore suggests that there may be numerous producers in a liberalized natural gas market. Hence, in a liberalized market consumers will not be exploited by suppliers. We calculate the electricity prices that would result from a pure "poolco" market with identical profit-maximizing generating firms. We advance theoretical concepts developed by Klemperer and Meyer (1989) and Green and Newbery (1992), and propose a new formula for the instantaneous market clearing price when generating firms adopt bidding strategies given by the Nash Equilibrium. Applying this formula to empirical electricity supply and demand data, we find that even in markets with a relatively high number of firms, the price of electricity is significantly higher than the short-run marginal cost of generation. We express the average annual price mark-up with a Price-Cost Margin Index, and show how it varies with market concentration, as measured by the Herfindahl-Hirschmann Index (HHI). We conclude that the Federal Energy Regulatory Commission's use of the HHI in its merger guidelines could prove inadequate in addressing market power concerns in deregulated poolco markets. The U.S. Federal Energy Regulatory Commission (FERC) requires electric utilities to offer six ancillary services. Most of the tariffs filed with FERC price these services on the basis of traditional cost-of-service (embedded) costs, Because most of these services are provided by generating units, however, it should be possible to create competitive markets for them. This paper describes, the structure of, and results from, a spreadsheet model that simulates markets for seven services: losses, regulation, spinning reserve, supplemental reserve, load following, energy imbalance, and voltage support. The model also analyzes, system control, although this service will continue to be provided solely by the system operator under cost-based prices. Developing this computer model demonstrated the likely complexity of markets for energy and ancillary services. This complexity arises because these markets are highly interdependent. For example, the cost of regulation (the frequent change in generator outputs to track the minute-to-minute fluctuations in system load) depends strongly on which units, are already being dispatched to provide energy and losses, their variable costs, and their operating levels relative to their maximum and minimum loading points. The "Regulatory Compact" and Implicit Contracts: Should Stranded Costs be Recoverable? Progress toward electricity market deregulation has brought controversy over whether or not utilities are entitled to compensation for "stranded costs", i.e., costs utilities will not be able to recover due to the advent of competition in their markets. This paper uses a legal and economic analysis of contracts to address the desirability of utility cost recovery. First, underlying principles of law are reviewed to determine whether or not there is a legal presumption of recovery. 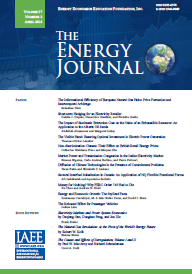 Then, the analysis considers whether or not an implicit "regulatory compact" between utilities and regulators follows from principles in the economic analysis of law, particularly theories of efficient breach and implicit contracts. The paper concludes that recovery should occur in only a proscribed set of circumstances and that, when called for, compensation should be partial, rather than full. Emission reductions could be provided by cleaner technologies as well as substitution towards less polluting inputs and goods. We develop a model to assess the scope for emission reductions by input substitution. We then apply the model to manufacturing in Chile and Indonesia-two developing countries considering air pollution control strategies. We estimate substitutability in input demand in manufacturing--using standard techniques-and combine these with emission factors to assess the potential for emission reductions via demand' changes. For sulphur oxides (SO) and suspended particulates (TSP), emission elasticities with respect to the price of heavy fuels range from -0.4 to -1.2. A price increase of 20 percent would reduce emissions of SOx, and TSP by 8 to 24 percent. While these results indicate how emissions can be reduced by presumptive taxes on fuels-clearing the air as well as the markets for energy-such a strategy preferably should be accompanied by other instruments that stimulate cleaner technologies. Similarly, emission standards should be accompanied by presumptive taxes on goods and inputs. Emission taxes, if feasible, optimally combine inducements along both avenues. This paper uses financial portfolio theory to demonstrate how the energy mix consumed in the United States could be chosen given a national goal to reduce the risky to the domestic macroeconomy of unanticipated energy price shocks. An efficient portfolio frontier of U.S. energy consumption is constructed using time-varying variances and covariances estimated with generalized autoregressive conditional heteroskedastic models. The set of efficient portfolios developed are intended to minimize the impact of price shocks, but are not the least cost energy consumption bundles. The results indicate that while the electric utility industry is operating close to the minimum variance position, a shift towards coal consumption would reduce price volatility for overall U.S. energy consumption. With the inclusion of potential externality costs, the shift remains away from oil but towards natural gas instead of coal.